We thought Singapore was great. Really clean and with some lively bars and restaurants. Liked the bird park at Jurong and the botanical gardens. On this day I was in charge of the money and miscalculated badly, which meant we didn't have the entry fee to see the alligator wrestling - Shame. Around the highest point there is some pristine jungle which, believe it or not, it is possible to get lost in! We did and emerged some time later sweating like pigs and looking terrible as we boarded the smart bus back to the hotel. We saw ants about an inch long which would detect your footfall and come after you. Also beware of the air conditioning, its entirely possible that you will die of hypothermia in your hotel lobby. 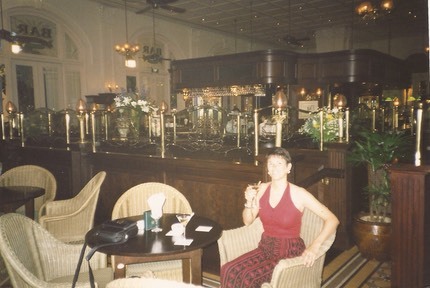 Had a drink in the Raffles Hotel. Got to be done. The Long Bar is pretty touristy, but the Billiard Bar was great. There is a stuffed tiger here that was shot some time ago, for not buying its round.